A hospital swimming pool poster issued by the American Red Cross has been removed following concerns that it was seen to be racist. 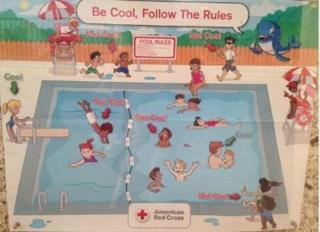 The safety poster proclaims "Be Cool, Follow The Rules" but depicts a scene with more black children being what the poster calls "not cool" while more white children appear to be behaving sensibly or "cool". John Sawyer, from Salida, Colorado, tweeted a picture of the poster taken by his wife, saying: "Hey, Red Cross, send a new pool poster to @SalidaRec because the current one they have with your name on it is super racist." The American Red Cross released a statement saying: "The American Red Cross appreciates and is sensitive to the concerns raised regarding one of the water safety posters we produced. "We deeply apologize for any misunderstanding, as it was absolutely not our intent to offend anyone. "As one of the nation's oldest and largest humanitarian organizations, we are committed to diversity and inclusion in all that we do, every day." The poster has now been removed from their website and they say will no longer be printed. But that hasn't stemmed the reaction online.